The new MudSling™ R1200 R/RS_LC is designed to protect these bikes' wide open suspension area and assorted underseat components from stone chip damage and mud accumulation. Protect your brand new ride from the start. 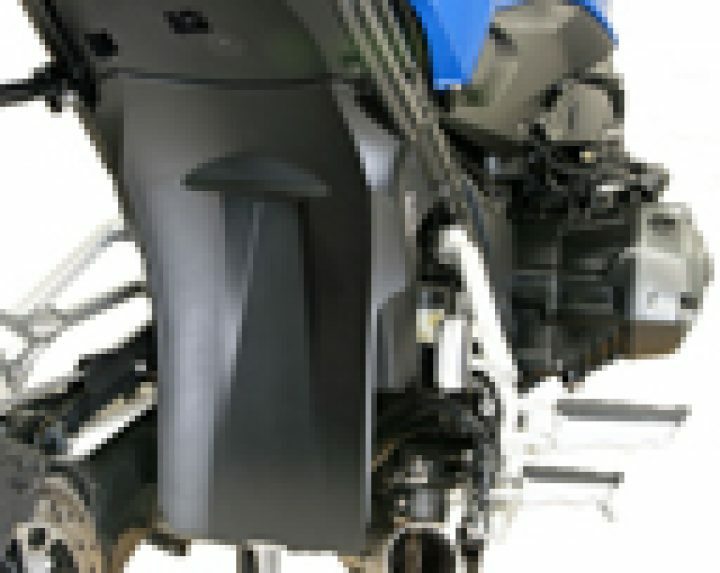 MudSling's effective coverage area is 8.5" wide x 16", protecting the Paralever arm, shock absorber, and electronics module, while reducing splash out to the sides onto riders' legs. It provides broad area coverage while looking slender from the side and well integrated with the R/RS bikes' styling. MudSling™ is precision injection molded in resilient polypropylene with a fine texture matching other plastic part surfaces on the R/RS. It mounts with one screw to a frame component and is further secured to the frame rails with nylon zip ties. See the installation video link below to see how easy it is to install.